In June it will be 2 years since my wife and I moved to Silicon Valley with our 2 kids. We absolutely love it here. She loves the weather, the diversity, and the beaches, and I love the ambitious, brilliant people I get to work with and the fact that I can work for a few dream companies. For a while I’ve been meaning to share what led us here and what I think makes SV unique. “After interviewing about two dozen candidates — none of whom had the strengths I sought — I interviewed Mark Cranney. He wasn’t what I expected; he didn’t fit the stereotype of a hard-charging sales executive. For starters, Mark was average height, whereas most sales executives tend to be rather tall. Next, he was a square guy — that is, he was as wide as he was tall. Not fat, just square. His square body seemed to fit rather uncomfortably into what must have been a custom-tailored suit — there is no way an off-the-rack business suit would fit a square guy like Mark. I put down the book and started to laugh. My wife asked me what was funny, and I told her that the book I was reading just talked about a guy from Southern Utah University (where we both went to school) and how interesting he sounded. “When I asked Mark for his references, he surprised me again. He gave me a list of seventy-five references. He said he had more if I needed them. I called every reference on the list, and every one called me back within one hour. Mark ran a tight network. Maybe these references were the sales FBI. Then, just as I was getting ready to make the hire, another executive on my team called to say that a friend of hers knew Mark Cranney and wanted to give a negative reference. Now I was laughing hard. And I had already concluded I had to meet Mark Cranney, this mythological sales leader who played football at the same school I played baseball. So, I did what I always do, and I cold-emailed him. Not my best effort…..but ok. I still remember reading that reply. Over the next few days I decided two things: 1) I wanted to work for Mark Cranney at Andreessen Horowitz, and 2) I was going to run a sales process to convince him to hire me. The only issue: I was just getting ready to start business school in 3 months, and there wasn’t a natural way to continue our conversation. Fortunately I had one last business trip in SF before starting school, and I emailed Mark again to see if he’d let me come by Sand Hill Road to meet him in person for 15 minutes. This is where I told him I was going to business school, but that I wanted to keep in touch. Yes, I had to work for Mark Cranney at a16z. Over the next semester I kept in touch, and finally decided to go for the kill. I put together a packet of all the companies I believed I could introduce to a16z to help their market development efforts and I sent it to Mark. The day the package was delivered, I called Mark and asked if he’d seen what I sent. Then I asked if I could intern there the following summer. Fortunately he gave me a chance at an interview that went well, and I spent the summer of 2015 on Mark’s team. For a 27-year old obsessed with startups, venture capital, and sales, it was a dream come true. During my time at Andreessen Horowitz I also tried to meet as many interesting people as possible. One of the people I admired most was Jason Lemkin, mainly because of his success building EchoSign and the straightforward advice he’d give on Twitter and Quora. So I emailed him. He replied. And after I followed up 4x, we finally met for 30 minutes one day while I was in SF. I told Jason I wanted to work for him during my second year of business school on any projects he needed, and I floated the idea of me helping review potential investments (pitch deck review, competitor analysis, customer interviews, etc) and fortunately he gave me a shot. I dug in. And then I got a few more projects. As a result, the second year of business school was a blast: I was able to help Jason review several deals and plan the VC portion of the SaaStr Annual in SF, instead of going to class. 2 year later and I’m still helping Jason with several projects as he grows SaaStr into a global $10 million+ business. All thanks to a lucky cold email. And some follow up. And a crisp 10-minute pitch. The final experience is a little bit of a rewind. During my first semester of business school I became enamored with this startup named Wealthfront. I had been a client for a while, loved the product, and was already somewhat of a finance nerd. 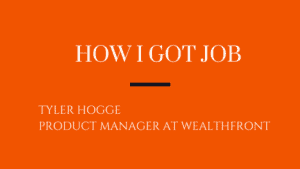 I had just completed the CFA exams and had a long-held belief that some startup was going to be able to automate most of financial planning, and Wealthfront seemed like the leading contender. I wanted to better test my hypothesis, so I often debated with smart people on twitter about Wealthfront’s potential. Most of the arguments I found against Wealthfront were pretty weak or ill informed. I eventually decided Wealthfront was a company worth making a bet on, and I already knew that I preferred joining a startup over trying to get into VC. Perhaps it was the a16z kool-aid, but I became convinced I needed to be an operator if I wanted to have a standout career. When I read this, I knew immediately how I’d reply. Passed the test. Best email I ever sent. 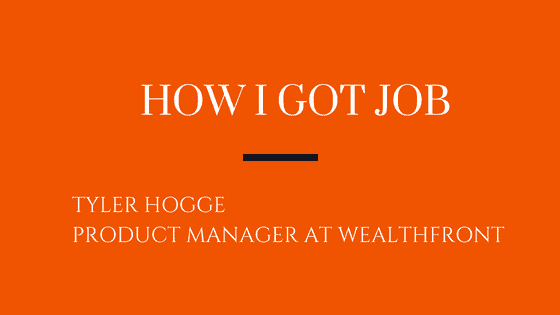 And now I’m a Product Manager at Wealthfront. So here we are. Two years in, with hopefully many more years to come. 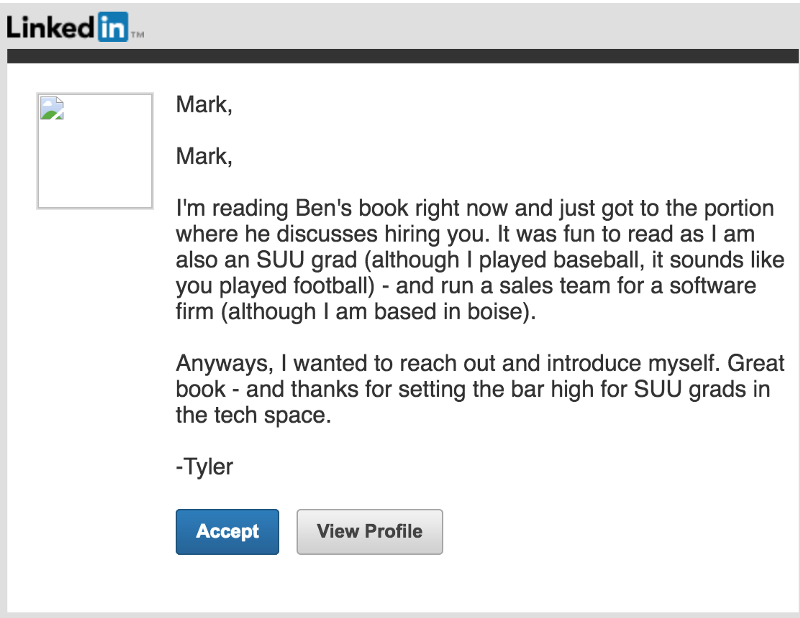 Cold emails work really, really well if you do them right. Almost no one does them right. The nuanced lesson here is how you can get someone who receives endless email to reply to yours. With a high degree of confidence. 3–4 essential things are required for a stellar cold email, but that’s a separate post. Identify 2–3 companies, not 10–15. Be targeted. Stalk those companies. I later learned Andy already knew who I was because I had tweeted positively about Wealthfront many times (and battled the trolls). So I won the deal before the reach out even happened. “Warm up” your emails by doing lots and lots of research. Add value in every interaction. No pointless “just following up to check in…” emails. Again: every interaction has to add value. Silicon Valley is a special place. I’m extremely grateful for the type of culture of giving and mentorship that exists here. Because almost no one is “native” Silicon Valley, you’re surrounded by people who at one point also wanted to break into the community, who received help, and who now pay it forward. It’s really a special place. To that end: if I can be helpful, reach out.